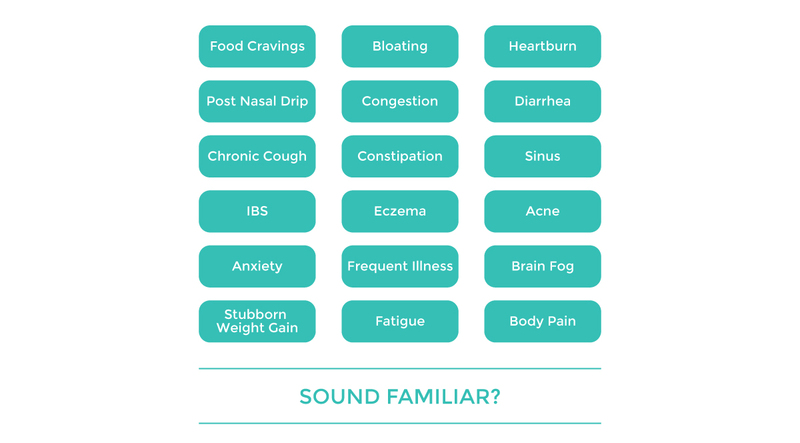 Identify Your Food Sensitivities And Transform Your Health While Enjoying Delicious Meals! This program has helped hundreds of people to reclaim their health and leave their symptoms behind! Remove all of the foods that most commonly lead to inflammation while enjoying a delicious, naturopathic doctor designed meal plan. Detoxify and nourish your body with a delicious whole food diet to relieve inflammation and feel better than you ever have before! 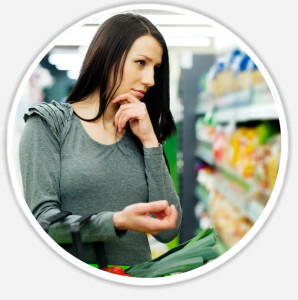 Test foods one at a time to identify the food sensitivities that are causing your chronic health concerns. Hello and welcome to the Elimination Diet Meal Plan! 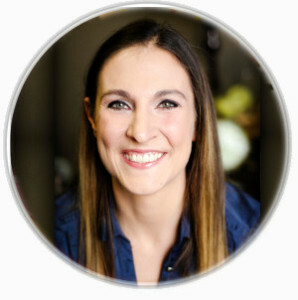 I’m Dr. Kimberley O’Brien, a Naturopathic Doctor on a mission to help you own your health and live a life you love! As an expert in nutrition and food sensitivities I help you overcome your fatigue, digestive upset and chronic symptoms through my Elimination Diet Meal Plan online program. 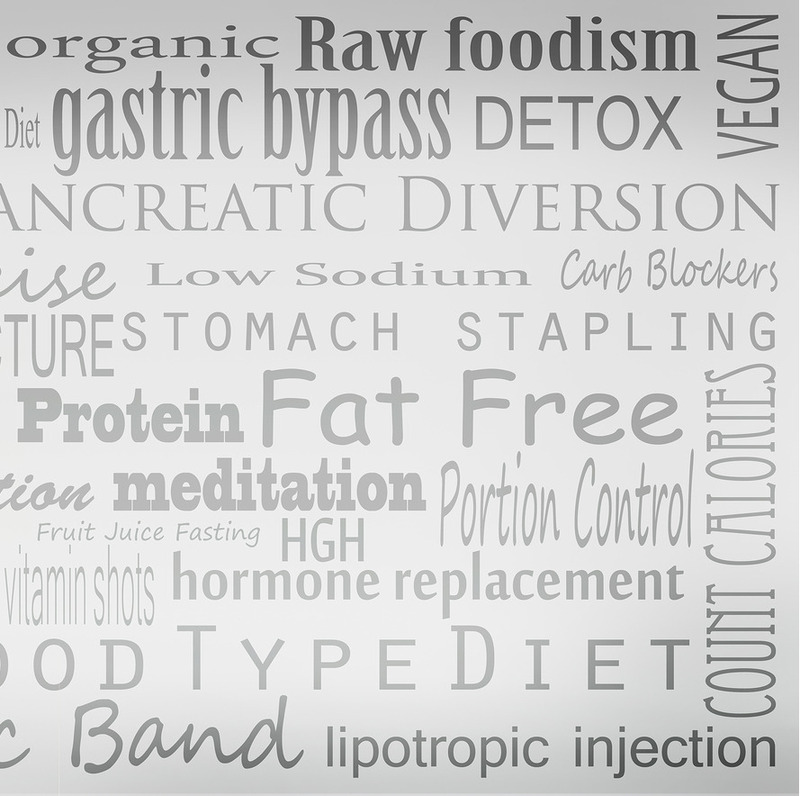 As a practicing Naturopathic Doctor I have worked with hundreds of patients in my practice to help them successfully navigate through an elimination diet. I’ve gathered information and feedback regarding the challenges my patients encountered and created a comprehensive guide to help you successfully identify your food sensitivities and transform your health. This program makes completing an Elimination Diet simple, straightforward and deliciously enjoyable! With the Elimination Diet Meal Plan, there’s no calorie counting, supplements or expensive diet shakes involved. Just real, healthy food and an easy plan to fuel your body for health and energy! "I was shocked at how good I felt after making the dietary changes!" "Prior to completing the Elimination Diet I had recently competed in a fitness competition. My extreme dieting caused me stomach problems and I couldn't pinpoint the foods causing my symptoms. I started with the Elimination Diet and found it to be amazing! While eating clean, I slept better and my body felt brand new. I have now identified the foods that were causing me issues and can eat without pain and discomfort after meals, which is a huge win for me. I would recommend the program to anyone, as you would never guess the foods that have been at the root cause of your health concerns. You may be shocked at how good you feel after making the dietary changes!" "I no longer need to count points, limit my serving sizes or watch the scale go up and down." 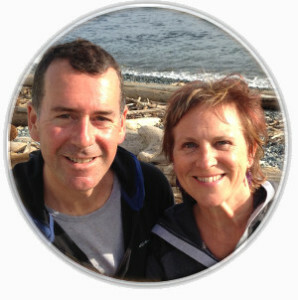 "Both my husband and I undertook the Elimination Diet, with surprising results. The eczema that he's had to endure for over 50 years completely disappeared after removing gluten and corn from his diet. I did the elimination along side Mark to support him, but found to my surprise that I have food sensitivities that I would never have considered, like gluten and citrus, for example. By removing these offenders, I no longer need to count points, limit my serving sizes or watch the scale go up and down. What a liberating experience this has been for us both!" 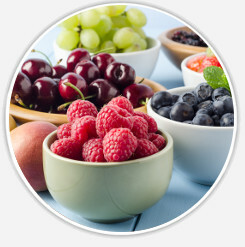 Food sensitivities occur when the immune system reacts to the foods in your everyday diet. 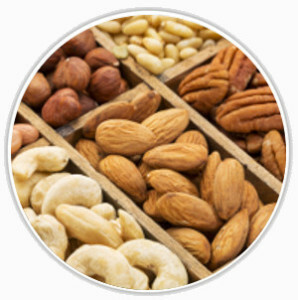 Unlike a food allergy, which leads to immediate and obvious symptoms like wheezing and anaphylaxis, food sensitivities occur due to a delayed immune reaction. The immune reaction takes up to 72 hours to peak after a food is eaten which makes identifying specific foods as the culprit to be seemingly impossible. Since most people consume their food sensitivities on a daily basis they end up chronically feeling tired and unwell yet typically don’t suspect that food may be the root cause. Imagine waking up feeling light, energetic and ready to take on your day! Once you are aware of the foods that are negatively affecting your health, you are in control. You will no longer feel uncertainty as to what's causing your symptoms and you won't have to struggle to avoid or suppress them! When you are eating a diet that fuels (instead of fools) your body you'll notice digestion that works flawlessly, weight-loss that becomes easy, energy that's no longer a struggle and skin that glows! "Within the first week I lost 7lbs by only changing my eating habits!" "I have tried many different diets and meal plans in order to better my health, however nothing seemed to stick and I would revert back to my old eating habits. After reading one of Dr. Kimberley's blogs about food sensitivities and realizing that I possessed EVERY single symptom she mentioned I knew it was time to take action and to start my journey towards a better healthy lifestyle. After only the first few days on the Elimination Diet, I could feel a total difference in my health! I was no longer tired and didn’t need afternoon naps, I had a lot more energy, I was no longer bloated after eating and overall I felt better. Within the first week, I lost 7lbs by only changing my eating habits! It was super motivating to see and feel the changes in my body. People started to notice and comment that I looked healthier, had nicer skin and had lost weight. The diet has motivated me and has helped me to keep eating better because I simply feel better! I would highly recommend that anyone try the Elimination Diet if they suspect food sensitivities. 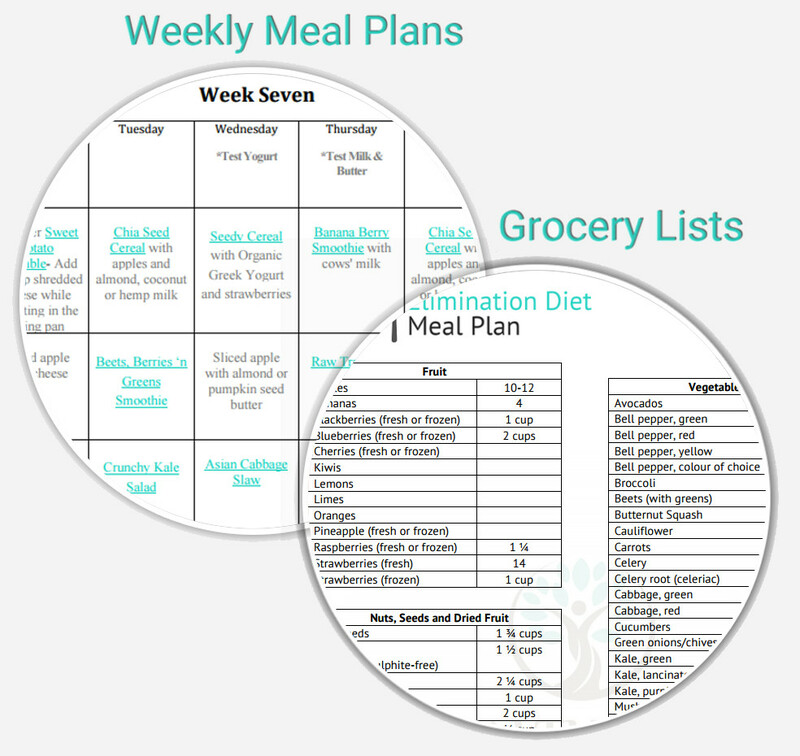 It is very user friendly and is set up so easily with a grocery list for each week, recipes and a tracking chart so that you can document how the diet is going for you during the week. The recipes are surprisingly delicious! Even my spouse loves the food I cook and I don’t have to make separate meals for him and I. I have learnt to really enjoy cooking thanks to this diet and really enjoy the food. It has been 2 months since I have started the Elimination Diet and I have lost a total of 13lbs (and counting! ), simply by changing my diet. My success started with the Elimination Diet which turned out to be one of the best decisions I have made to own my health!" 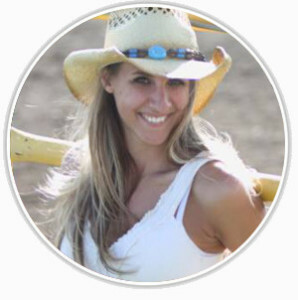 Lindsay Clark- "Lindsay Clark Coaching"
"Completing the Elimination Diet was absolutely transformative to my health. I began the program out of necessity, having struggled with depression and some serious digestive health issues for months on end. Within a few weeks on the Elimination Diet, I had more energy, less brain fog, and less pain in my abdomen. The inflammation decreased in my body and over the next couple of months I lost 10 lbs! It was so wonderful to feel life return to my body as I removed foods that were toxic to my health. In coordination with energy healing work, my mood improved significantly, bringing me back to the person I recognized as energetic and motivated and joyful! The Elimination Diet program really helped me to finally identify the foods that had been troubling my body for years, and I’m grateful to finally feel healthy and know how to maintain a state of harmony. "The Elimination Diet helped me to finally identify the foods that had been troubling my body for years!" Identify foods that are causing your pain and heal your body with nutrients that replenish your cells and reduce inflammation! Find the cause of your skin concerns! Acne and eczema are often aggravated by food sensitivities and an allergen-free Elimination Diet will allow your skin to glow! 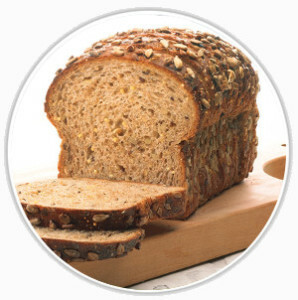 Food sensitivities cause you to feel sluggish and tired. 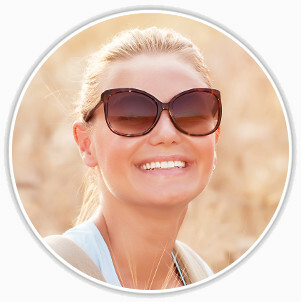 Transform your health through food and radiate with youthful energy from the inside out! Food sensitivities increase the release of cortisol and contribute to stubborn weight gain. Transform your diet and your ideal body will follow! With over 70 simple yet delicious recipes, you will continue to enjoy these nutritious meals even beyond completion of the Elimination Diet program! 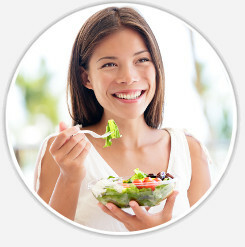 Transform your diet and experience relief from gas, bloating and irregular bowel movements. You can experience blissful digestive function and feel amazing after meals! 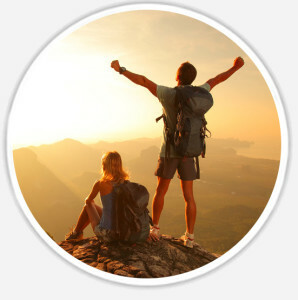 This program will transform your health and teach you to create lasting change! With lifetime access to the program, all of the information is yours long after completion of the Elimination Diet! Food sensitivities can cause “Brain Fog” and leave you feeling like you’re a zombie! Experience improved concentration while feeling calm and relaxed! Is The Elimination Diet Meal Plan Right For Me? 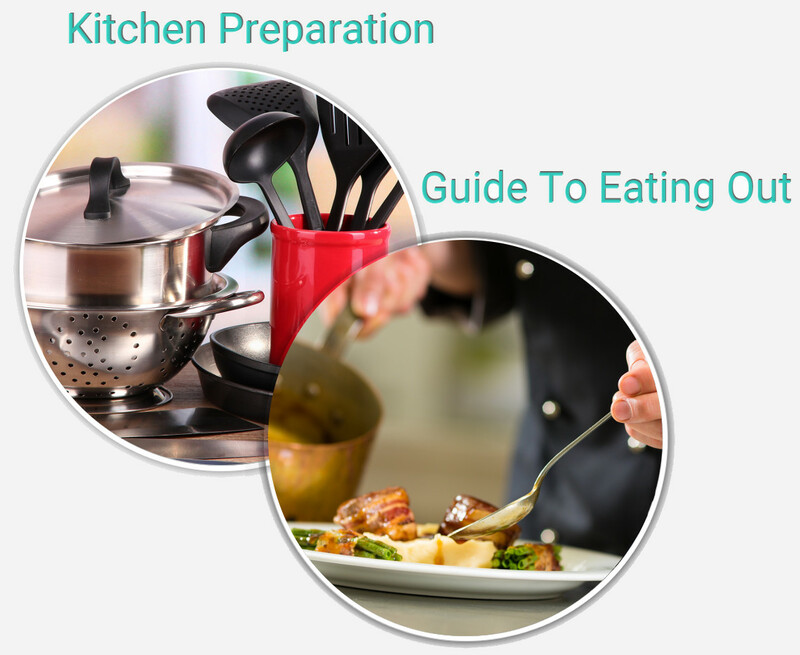 You are willing to learn basic cooking skills and to prepare simple, healthy meals at home. 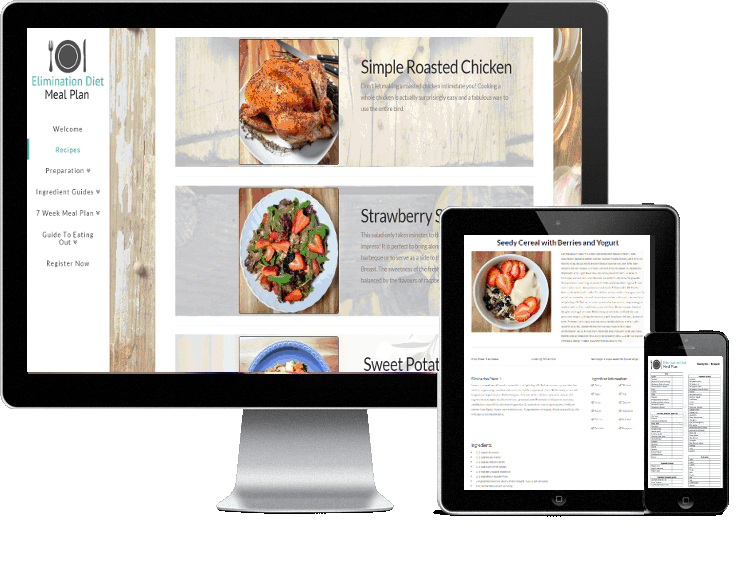 All recipes are detailed enough that even a beginner in the kitchen will be able to successfully cook absolutely delicious meals! You have been searching for a comprehensive program that leaves out the guesswork and provides you with completed meal plans, grocery lists and all the information required for your success! 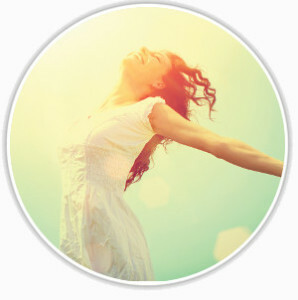 You are ready to rid yourself of your chronic symptoms, lose weight and feel renewed! Whether you have been feeling a bit sluggish lately or struggle with more pervasive symptoms, this program will help you to uncover whether food is the culprit and help you to feel your best again! "My energy on the elimination diet skyrocketed and I felt fantastic!" 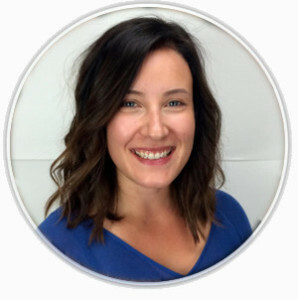 "When I started this program I didn't think that I struggled with food sensitivities and I wanted to try the diet only because I thought it may be beneficial for some of my clients. However, once I started the plan I quickly realized that my energy had been low and that I was always bloated (but had attributed it to stubborn pounds that had remained after my baby). My energy on the elimination diet skyrocketed and I felt fantastic! I did not feel restricted by the foods I could eat and created amazing meals and snacks. My family enjoyed the process so much that we are adopting many of the same foods we were consuming on the Elimination Diet into our everyday diet. I can't imagine going back to the way I felt before. No amount of sugar or caffeine is worth the feelings of discomfort and lethargy that I was living with." "Not only is the food amazing, but it has me feeling amazing too!" "I'm feeling better than I have in years! Not only is the food amazing, but it has me feeling amazing too!" How Is The Elimination Diet Meal Plan Different From Other Diet Programs? The Elimination Diet Meal Plan is unique because it allows you to identify specifically how food affects your body and individual physiology. Have you ever been frustrated after trying a diet that worked so well for your friend, but produced no results for yourself? Imagine consuming a low-carb or “paleo” diet without realizing that you are sensitive to eggs and nuts! You might feel bloated, tired and frustrated that the scale won’t budge, while others might feel amazing and lose weight on the very same diet! The Elimination Diet Meal Plan allows you to identify which foods cause you inflammation, pain and weight gain and to create a long-term diet plan that is fully individualized to your health. You will receive Instant Access to the program when you sign up! There is no waiting for books and products to be delivered to your door or for the program to begin on a set start-date. You will gain immediate access to the full Elimination Diet Meal Plan program upon purchase and can get started with the program as soon as you would like! This allows you to familiarize yourself with the program in advance and to get started on the path to feeling AMAZING as soon as possible! 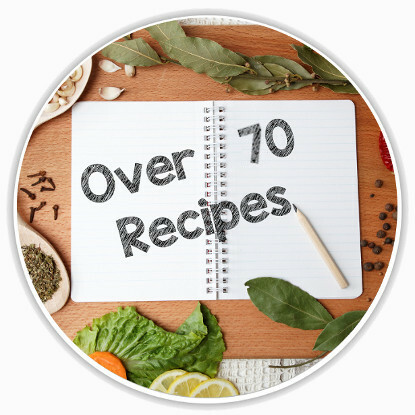 Your taste buds will love you with Over 70 Delicious Recipes to choose from! 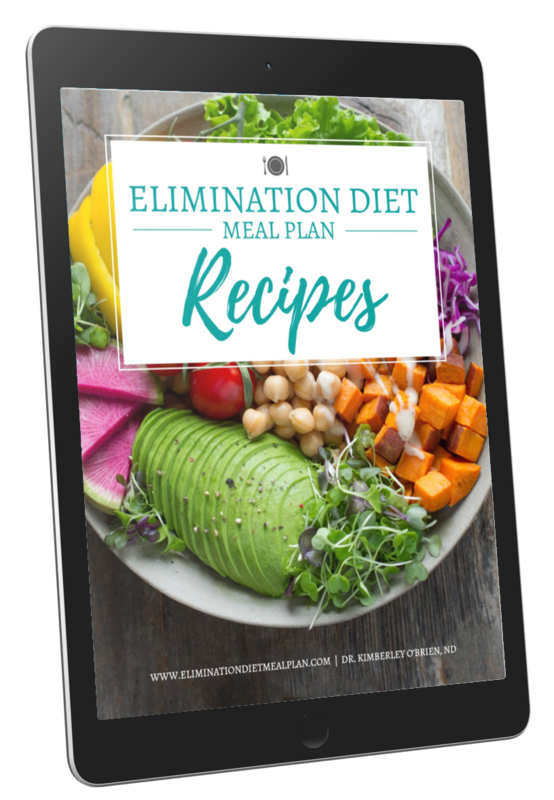 The Elimination Diet Meal Plan program contains over 70 recipes exclusive to the program for homemade cereals, salads, soups, stews, roast chicken, stir-fries, gluten-free pasta, salad dressings, desserts, smoothies and more! All recipes are naturopathic doctor approved and absolutely DELICIOUS! These whole food, Elimination Diet-friendly recipes promote detoxification, relieve inflammation and nourish your body on a cellular level! 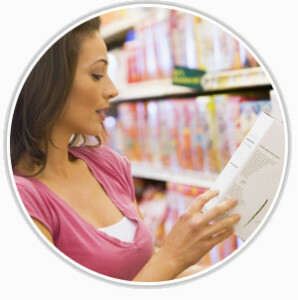 Naturopathic Doctor-designed Symptom Questionnaires & Tracking Guides make it easy to identify your food sensitivities! The symptoms of food sensitivities can be subtle and difficult to identify without professional guidance. 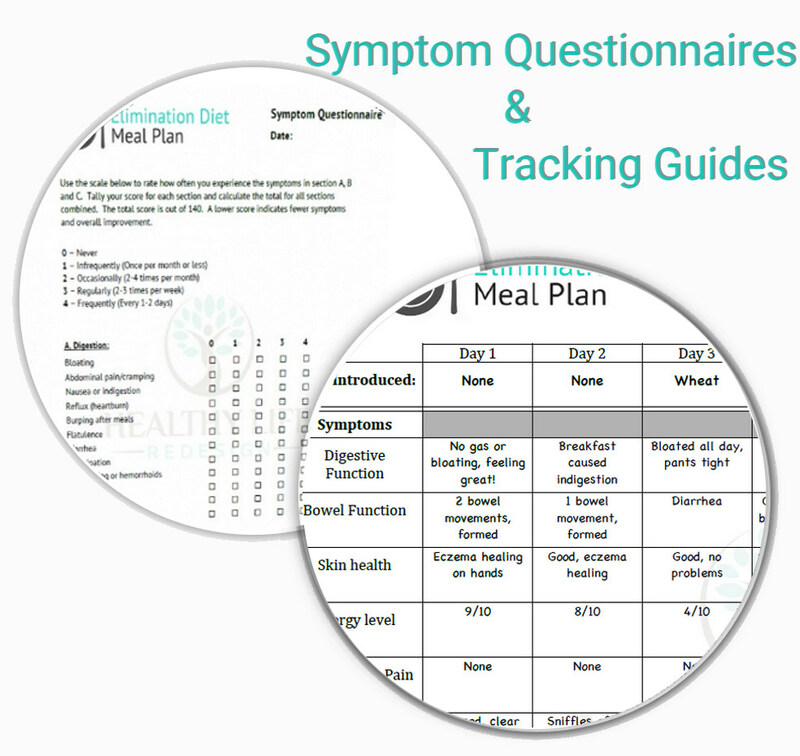 The symptom evaluation questionnaires and food reintroduction symptom tracking forms that are included with the Elimination Diet Meal Plan program make this process easy! You will be able to track your progress and symptom improvement through the program and will be guided as to the specific symptoms you may experience that indicate the presence of food sensitivities. 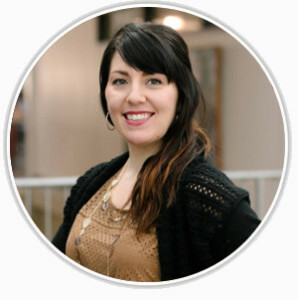 It's like having a Naturopathic Doctor right there with you to guide you through the entire process! The Meal Plans & Grocery Lists for the entire 7-Weeks have all been prepared for you! All of the meal plans are naturopathic-doctor designed and grocery lists are fully prepared for you. This takes the guesswork out of the Elimination Diet protocol and you will love the variety of foods that you get to enjoy. There is no deprivation involved in this program and meal plans include daily breakfast, lunch, dinner and two snacks. The meal plans and grocery lists will save you countless hours that would otherwise be spent planning recipes that are suitable for the Elimination Diet. You will also be spared making any mistakes that cause you to accidentally reintroduce the eliminated foods too soon. These meal plans have been designed so that EVERYONE will be able to follow along with absolute ease! The Elimination Diet Meal Plan program provides you with invaluable tips and guidance for your ultimate success! Learn how to set up your kitchen and stock your pantry for easy food preparation! You will find information on time saving tools for food preparation, grocery staples that you should always keep stocked in your pantry and helpful guides for reading ingredient labels. It is recommended to cook your own meals during the Elimination Diet Meal Plan program, but it is understood that this isn’t always possible. You will find a “Guide to Eating Out” that provides details on what to request and what to avoid when eating out at a variety of different restaurants. Here Are More Reasons For You To Get Started! "Some things - like the salad dressings - are simply the only dressings we now serve." "The Elimination Meal Plan is simply excellent! I initially followed it in the fall of 2015 and felt wonderful after just one week or so. The recipes are so delicious and my husband and son are keen to eat the meals too - no more making two types of dinner! Some things - like the salad dressings - are simply the only dressings we now serve. I love the Detox Soup, cereals, all the chicken meals and the Turkey Sweet Potato Scramble best...but everything is really good! During the holiday season I fell back a little to old habits but I just started the meal plan again this week and was actually really looking forward to it, believe it or not! I tell everyone I know with any digestive issues or potential food sensitivities to sign up. This is an excellent service and I wish you continued success!" "I have not only noticed improvements in my digestive health, but also in my skin health and overall energy levels." 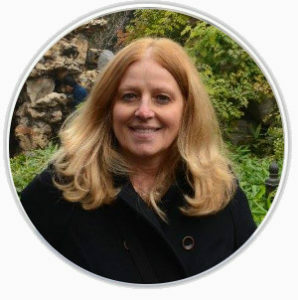 "I had been suffering from chronic GI issues for over 4 years and never realized how negatively the "healthy" foods that I was eating were affecting my body and GI health until I started the elimination diet. I am so glad that I took the time and energy to figure out which foods I was sensitive to and why they were having such a bad effect on my body. I thought my stomach was supposed to grumble and rumble after every meal. I thought that meant it was working. I now know that is not the case! I have not only noticed improvements in my digestive health, but also in my skin health and overall energy levels." Is the Elimination Diet Meal Plan a weight loss program? Food sensitivities can cause an increase in the release of cortisol, a stress hormone that makes weight loss very difficult! People tend to see stubborn weight gain around their midsection when suffering from food sensitivities and excess cortisol. 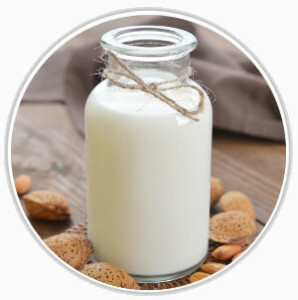 Food sensitivities also commonly lead to bloating and water retention, which resolve fairly quickly with the removal of allergens and the clearing of inflammation. While the primary intention of the Elimination Diet Meal Plan program is to identify food sensitivities, for the above reasons weight loss is extremely common! Many people lose several pounds within the first week alone. The Elimination Diet Meal Plan is a great way to shed a few pounds quickly and the identification of your food triggers will also help you keep the weight off long-term. 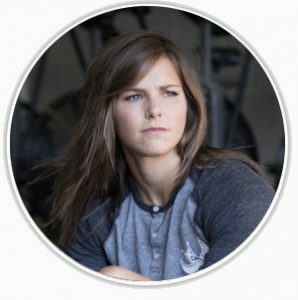 Is the Elimination Diet Meal Plan right for me as an athlete or someone who doesn’t want to lose weight? The Elimination Diet Meal Plan can be modified to suit any appetite and there is no need to go hungry. If you find that you are not getting enough food to satisfy your appetite while following the pre-made meal plans, you are free to eat more food. During all phases of the diet you can make any of the recipes that are labeled as “Elimination Phase” at any time. Some of the recipes labeled as “Reintroduction Phase” can also be modified to be suitable for the Elimination Phase and instructions are provided in that regard. There is no need to feel hungry or deprived! Is the Elimination Diet Meal Plan suitable for my family or will I need to cook separate meals for my kids? While the Elimination Diet Meal Plan is designed for adults, children will also enjoy many of the recipes! The majority of the time there is no need to cook separate meals and your kids will also benefit from the nutritious, healthy food. While the recipes themselves are suitable for children, the program is created for adults and isn’t intended for kids under 12 years of age. 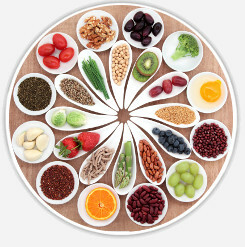 Before beginning any dietary program you should check with your pediatrician, naturopathic doctor or nutritionist to assess whether their nutritional requirements will be satisfied. Is the Elimination Diet Meal Plan appropriate if I am pregnant or breast-feeding? The Elimination Diet Meal Plan is a healthy, nutrient rich and whole food diet that is appropriate for most women even if pregnant or breast-feeding. It is important to check with your family physician or naturopathic doctor prior to beginning any dietary plan, including the Elimination Diet Meal Plan, to ensure that it is appropriate for your specific needs and nutritional requirements. Is the Elimination Diet Meal Plan suitable for vegetarians and vegans? Yes! There is a separate vegan meal plan with tons of vegan and vegetarian recipes that you will love! Are supplements required as part of the Elimination Diet Meal Plan? Supplements are not required as part of the Elimination Diet Meal Plan but if you are already on a supplement regime you may definitely continue with it as long as the products do not contain any of the ingredients to be avoided. Ingredients that are commonly added to supplements that you should avoid include corn starch, gluten, dairy and soy. Protein powders made from ingredients that are tested during the diet (ex: whey, pea or rice protein) should also be avoided. 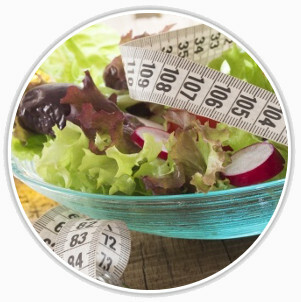 Which foods will I be eliminating and testing with the Elimination Diet Meal Plan program? Quinoa, rice, tree nuts, citrus fruits, nightshade vegetables (bell peppers, tomatoes, eggplant, potatoes), legumes, peanuts, chocolate, corn, soy, oats, eggs, wheat and gluten-containing grains, cheese, yogurt, milk and butter. During the most restrictive Elimination Phase you will still be able to enjoy a diet rich in vegetables, fruits, seeds, lean meats and fish. After the Elimination Phase, foods will be reintroduced throughout the next 5-weeks to evaluate for inflammatory reactions. Do I receive access to the entire program all at once? Yes! You will receive full access to the entire program and all 7-weeks of the meal plan as soon as you purchase the Elimination Diet Meal Plan. This means that you can take as long as you would like to prepare for the diet and can complete the program at your own pace. How long do I have access to the program for? You will receive LIFETIME ACCESS to the Elimination Diet Meal Plan upon purchase of the program. The recipes and all other information in the program will be yours FOREVER! What happens after I purchase the program? Once you click the “Get Started Now” button, you will be taken to the checkout page where you will create your username and password. Once your payment is processed you will receive an email with your login instructions and can immediately access the full Elimination Diet Meal Plan program! 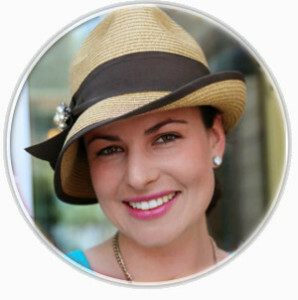 * Health Coaching supports you through the Elimination Diet Meal Plan and answers your general health and diet questions. The sessions provide you with motivation, accountability and clarity throughout the diet plan. Please note that without Dr. Kimberley cannot provide a specific medical diagnosis or personalized treatment plan over the phone or Skype. Please note that health coaching is not covered under the Naturopathic Medicine category through extended health benefits. ** Completed health coaching sessions are non-refundable. *** Please note that the "Recipes Only" option is non-refundable and is exempt from the 7 day money back guarantee. Disclaimer: Information on this website is provided for informational purposes only. This information is not intended as a substitute for the advice provided by your physician or other healthcare professional. Do not use the information on this website for diagnosing or treating a health problem or disease without first consulting with your doctor. Results may vary and will be subject to your health conditions and compliance to the program. 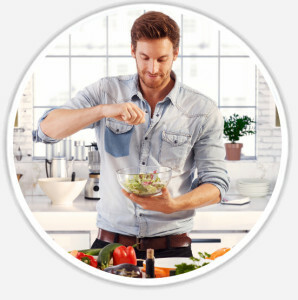 Try 6 recipes from the Elimination Diet Meal Plan for FREE! No, I don't want to download the recipe book.